In this tutorial we are going to show you how to change the Hero Section image on your site! You might be asking what your Hero Section is though. It’s actually that first section you see when you hit your site’s homepage. It contains your main image for the site, as well as your call to action, and your lead capture form. Your Hero Section will always be on your home page, as well as any duplicates to the home page that you make (this includes your city specific landing pages). The hero section help yous set your site apart and localize it for your market area. If you don’t have an image that you want to put in the Hero Section yet, got to our Learn More section for more details. *You may have to click the drop-down button pointed out above to be able to click the “Set featured image” link. 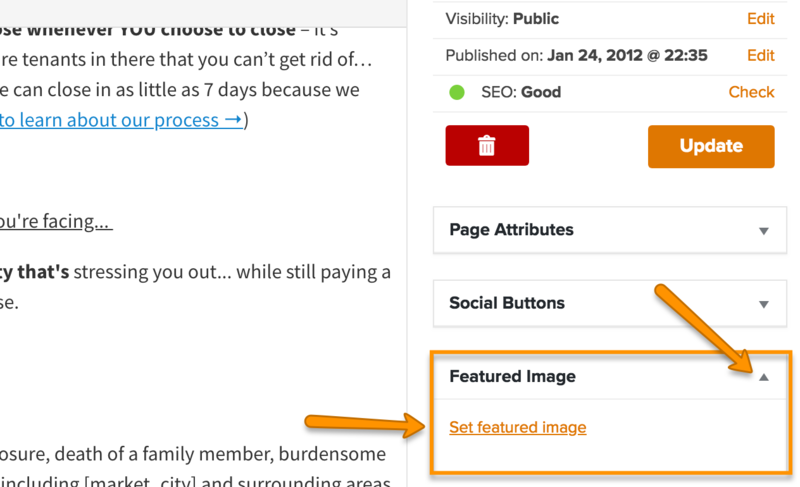 *You’ll know your image is selected if there’s a checkmark in the upper right-hand corner. You can see this pointed out above. *Adding keyword rich text to your Alt Text box (pointed out above) is a great way to boost your SEO! There ya go! You should now have a brand new image in your Hero Section! Nice Work!